Remind yourself of how unpredictable the world can be. A brief synopsis and definition on this particular school of Hellenistic philosophy: Stoicism was founded in Athens by Zeno of Citium in the early 3rd century BC, but was famously practiced by the likes of Epictetus, Seneca and Marcus Aurelius. The philosophy asserts that virtue (such as wisdom) is happiness and judgment should be based on behavior, rather than words. That we don’t control and cannot rely on external events, only ourselves and our responses. It had three principal leaders. Marcus Aurelius, the emperor of the Roman Empire, the most powerful man on earth, sat down each day to write himself notes about restraint, compassion and humility. Epictetus endured the horrors of slavery to found his own school where he taught many of Rome’s greatest minds. Seneca, when Nero turned on him and demanded his suicide, could think only of comforting his wife and friends. But it is not only those three—Stoicism has been practiced by kings, presidents, artists, writers and entrepreneurs. Both historical and modern men illustrate Stoicism as a way of life. Prussian King, Frederick the Great, was said to ride with the works of the Stoics in his saddlebags because they could, in his words, “sustain you in misfortune”. Meanwhile, Montaigne, the politician and essayist, had a line from Epictetus carved into the beam above the study in which he spent most of his time. The founding fathers were also inspired by the philosophy. George Washington was introduced to Stoicism by his neighbors at age seventeen, and afterwards, put on a play about Cato to inspire his men in that dark winter at Valley Forge. Whereas Thomas Jefferson had a copy of Seneca on his nightstand when he died. The economist Adam Smith’s theories on the interconnectedness of the world—capitalism—were significantly influenced by the Stoicism that he studied as a schoolboy, under a teacher who had translated Marcus Aurelius’ works. Stoicism differs from most existing schools in one important sense: its purpose is practical application. It is not a purely intellectual enterprise. It’s easy to gloss over the fact that Marcus Aurelius was the Roman Emperor without truly absorbing the gravity of that position. Emperors were Deities, ordinary men with direct access to unlimited wealth and adulation. Before you jump to the conclusion that the Stoics were dour and sad men, ask yourself, if you were a dictator, what would your diary look like? Stoic writing is much closer to a yoga session or a pre-game warm up than to a book of philosophy a university professor might write. It’s preparation for the philosophic life where the right state of mind is the most critical part. 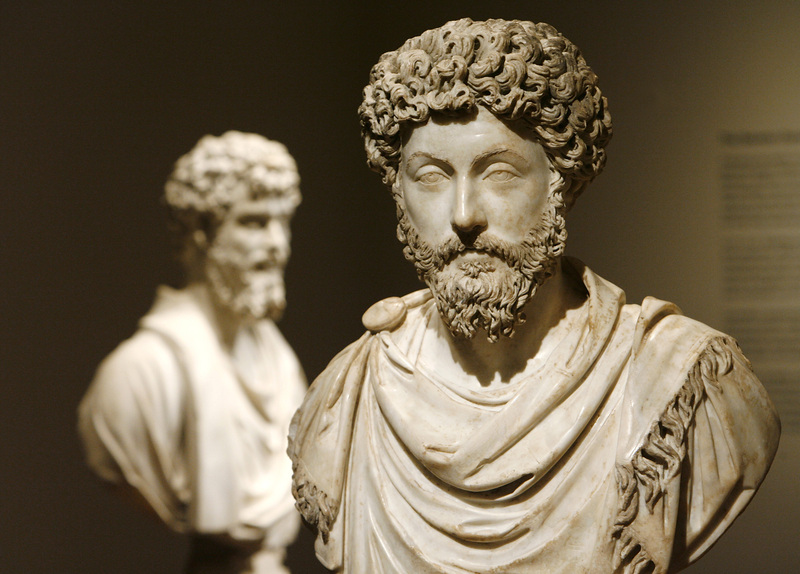 Stoics practiced what are known as “spiritual exercises” and drew upon them for strength. Practice what you fear, whether a simulation in your mind or in real life. The downside is almost always reversible or transient. Suppose for a second that you are trying to help someone and they respond by being surly or unwilling to cooperate. Instead of making your life more difficult, the exercise says, they’re actually directing you towards new virtues; for example, patience or understanding. Or, the death of someone close to you; a chance to show fortitude. Note: This exercise served as the inspiration behind The Obstacle Is The Way. It is important to note that ‘passion’ here isn’t the modern usage we’re familiar with as in enthusiasm or caring about something. As Don Robertson explains in his book, when the Stoics discuss overcoming ‘passions’, which they called patheiai, they refer to the irrational, unhealthy and excessive desires and emotions. Anger would be a good example. What is important to remember, and this is the crucial bit, they seek to replace them with eupatheiai, such as joy instead of excessive pleasure. Returning to the point of the exercise, it’s simple: remember how small you are. For that matter, remember how small most everything is. Remember that achievements can be ephemeral, and that your possession of them is for just an instant. If everything is ephemeral, what does matter? Right now matters. Being a good person and doing the right thing right now, that’s what matters and that’s what was important to the Stoics. Take Alexander the Great who conquered the known world and had cities named in his honor. This is common knowledge. The Stoics would also point out that, once while drunk, Alexander got into a fight with his dearest friend, Cleitus, and accidentally killed him. Afterward, he was so despondent that he couldn’t eat or drink for three days. Sophists were called from all over Greece to see what they could do about his grief, to no avail. Learn from Alexander’s mistake. Be humble and honest and aware. That is something you can have every single day of your life. You’ll never have to fear someone taking it from you or, worse still, it taking over you. Want more? Sign up for the Daily Stoic newsletter now and receive the free 7 day “stoic starter pack” packed with resources on Stoicism—from more stoic exercises to recommended books—as well as a chapter from bestselling author Ryan Holiday’s book, The Obstacle Is The Way. Already know all of this? Do you want more advanced material? We recommend heading to our glossary of Stoicism terms and reading our post on the 28 books on Stoicism you need to read to advance your knowledge. You can also explore our Stoicism interviews which range from philosophy professors to MMA fighters. Oh, and if you’re looking for a great Stoicism quote, we have you covered. Originally published at dailystoic.com. Stoicism is an ancient practical philosophy that’s been used by everyone from George Washington to Tim Ferriss to the New England Patriots as a source of much needed strength and stamina for their challenging lives. Click here to get the Daily Stoic’s free 7-day intro to Stoicism right now!